I started making progress on this little dress again after all the costume sewing craziness literally buried it in sequins. So far, the instructions have been clear and easy to execute. 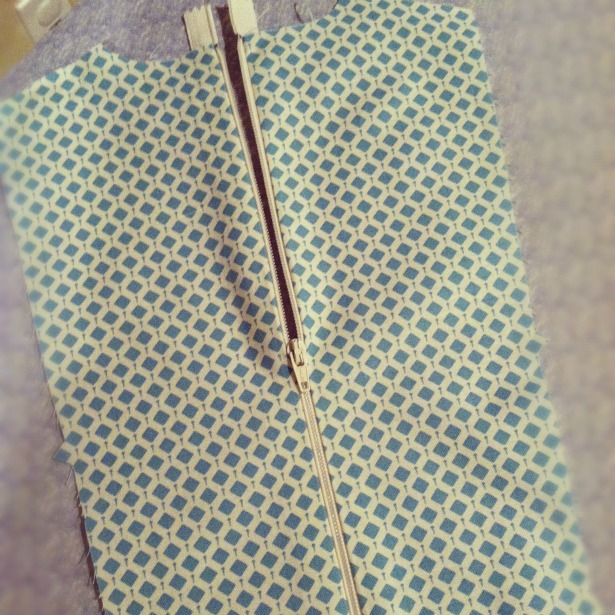 I even got the zipper sewn in right on my first try which I think may be a record for me - usually zippers and I don't get along well. Probably because I never learned how to sew them properly, which I tell myself I need to do every time and save myself the frustration of ripping them out. It's silly, really. I got as far as the front yoke and then my progress was halted once more, this time by fabric choice. I had wondered if I should make the yoke out of a solid color in the beginning, and after seeing it all in the diamond print I don't have to wonder anymore. The best part of this dress, in my opinion, is the unique pointed yoke and it just doesn't stand out enough as it is... so, off to the fabric store to decide - blue or cream? 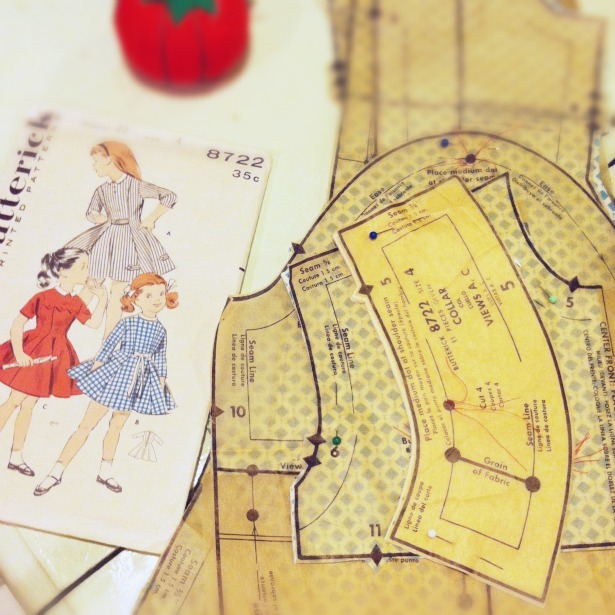 Are you sewing up a pattern? If so, leave me a link in the comments, I would love to see! 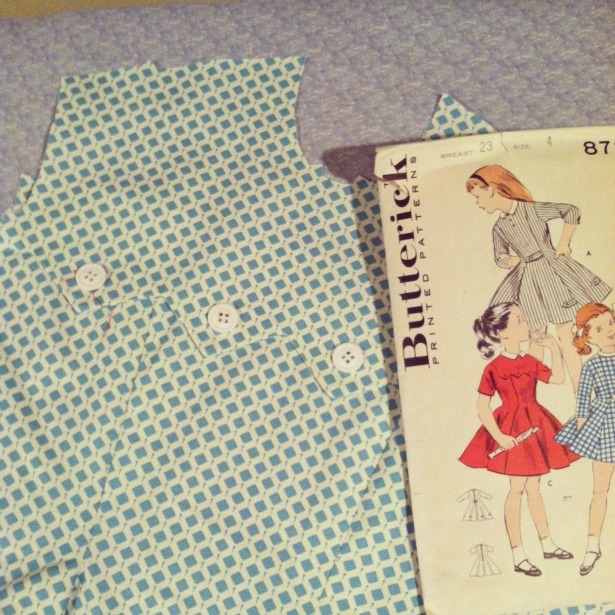 what an adorable dress that is going to be! I need to get working- I've got an overalls pattern I want to try for Avery, as well as a cute jumper I want to attempt (no pattern). When you first mentioned a different colored-yolk, my mind immediately thougth pale yellow! But if you're wanting to stay with blue or cream, I'd vote blue! I also vote blue. Although either would look cute. Super adorable pattern! http://urbanmoppets.blogspot.com/. 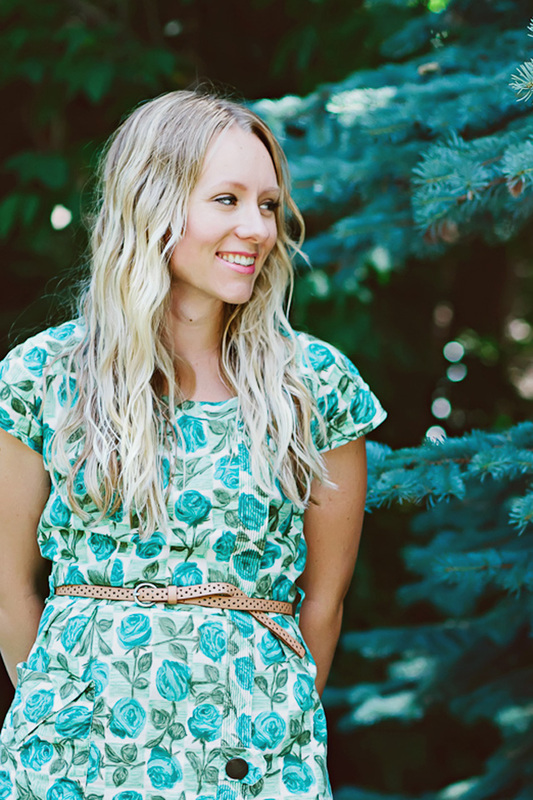 having so much fun with vintage patterns! That dress is going to be darling!! I haven't ever sewn from a pattern and worry that it might be more than I can handle! HAHA!